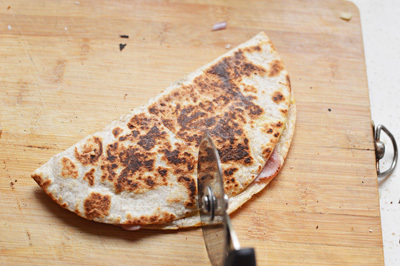 These beautiful mounded beauties that you feast your eyes on, are my put together in a jiffy breakfast quesadillas. 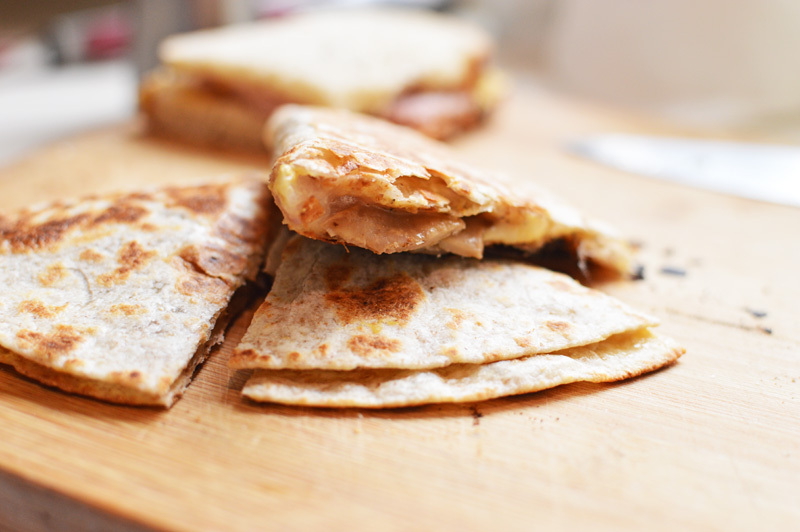 There’s a certain delicious hum to the word ‘Quesadilla’, like uttering an exotic mantra for a cheesy sandwich. 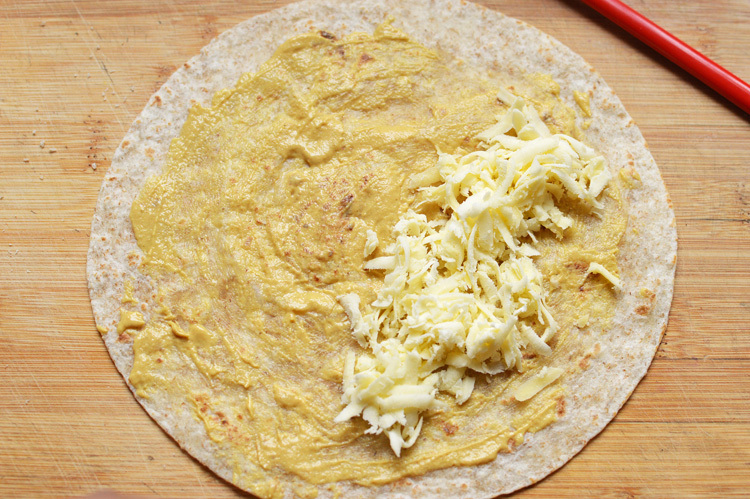 Well, that’s what it really is..it’s cheese in a tortilla and while I confess these are not completely authentic or remotely Mexican, I assure you that these are delightfully tasty to eat and offensively easy to put together. This is the kind of dish that requires minimum efforts with maximum rewards. This dish belongs to the ‘lazy day special archives’. It happened simply becauseI was in no mood for chopping, cutting, baking, cooking or even lingering around the stove. I just wanted to settle with a bag of chips when I saw some leftovers, cheese, and ham in the fridge and it was nothing short of a divine revelation when I decided to myself that this is SPARTAAA!! no not really though! 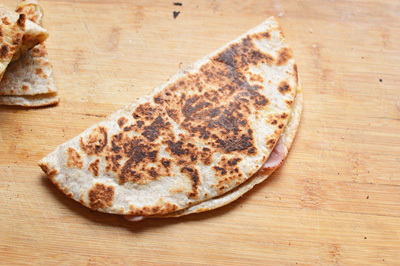 I just decided that I’d make meself some quesadilla. 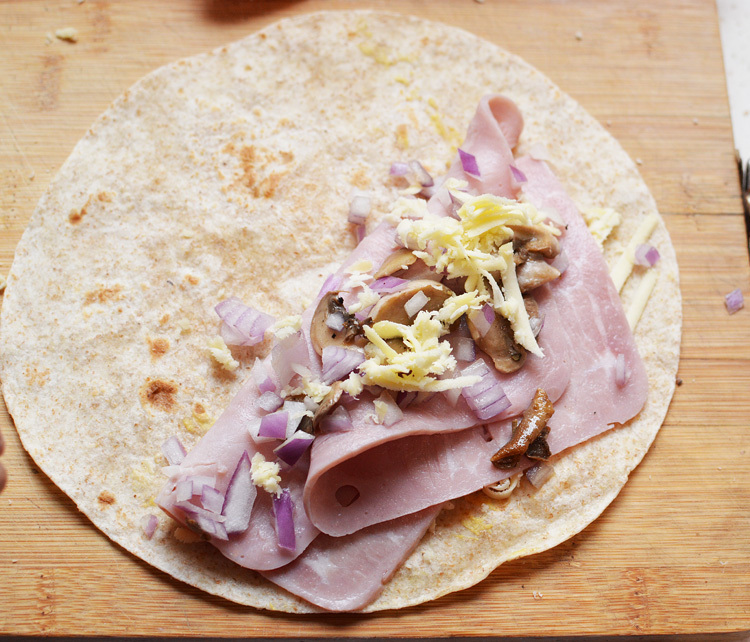 This is how it began..
wholewheat tortilla, pepper, mozzarella and parmesan cheese, ham, leftover sauteed mushrooms and some leftover chopped onions and dijon mustard. 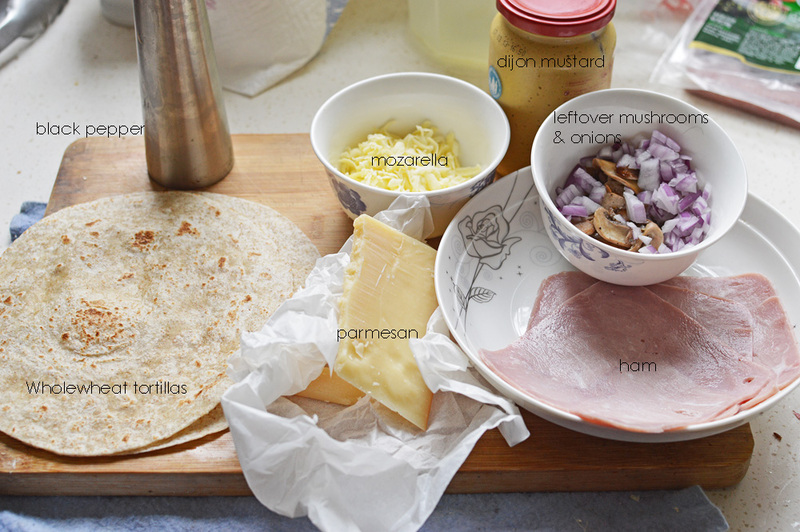 Before I begin, let me tell you that you can substitute these ingredients with whatever you fancy, or whatever leftovers you have in the fridge. Fried eggs, baked potatoes, leftover chicken, crispy bacon are all good. 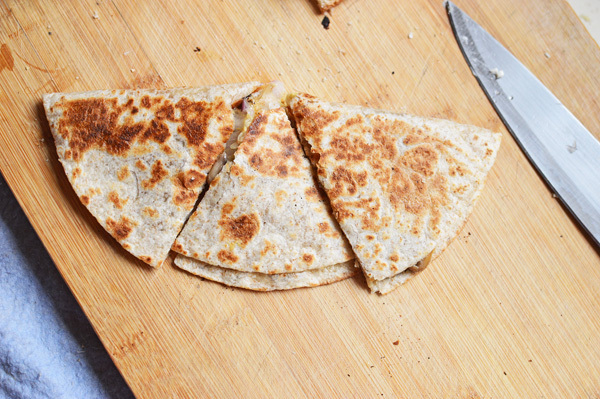 Anything that suits your mood or your appetite can be turned into this quesadilla. Just raid your fridge and go nuts. 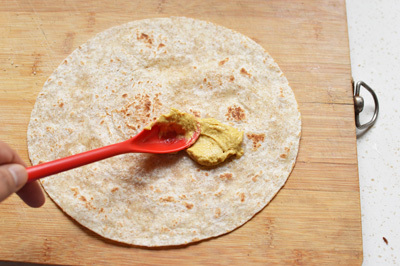 a good heap of dijon mustard, for what would be life without this goodness? spread it liberally. I might have gone overboard but you know how you like it. 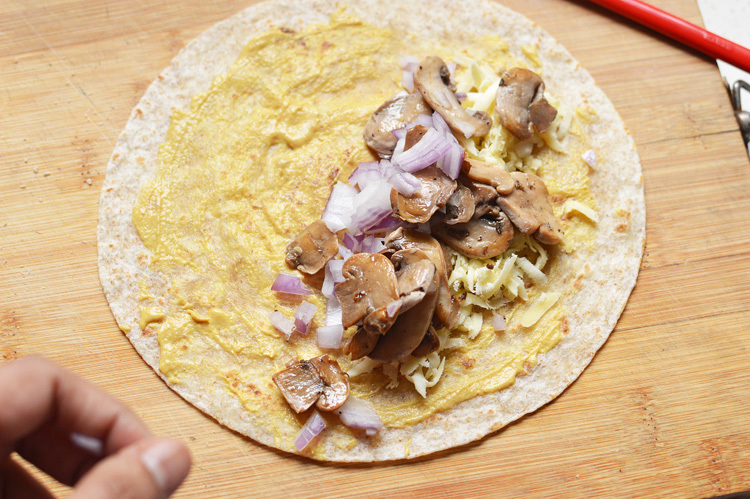 leftover sauteed mushrooms and onions and a sprinkling of pepper. cover with some more cheese, in this case parmesan. 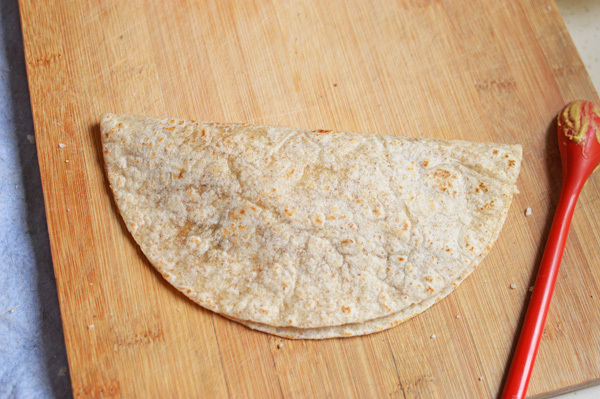 fold over the plain side on the fillings to form a half moon. 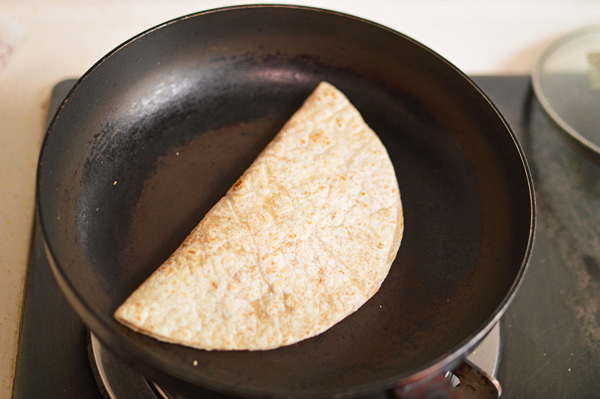 on a hot dry pan (you don’t need any oil) let it cook for a couple of minutes and flip once it’s browned a bit. finally some cheese, form into half moon and on a hot pan. let brown on both sides and this is pretty much done. 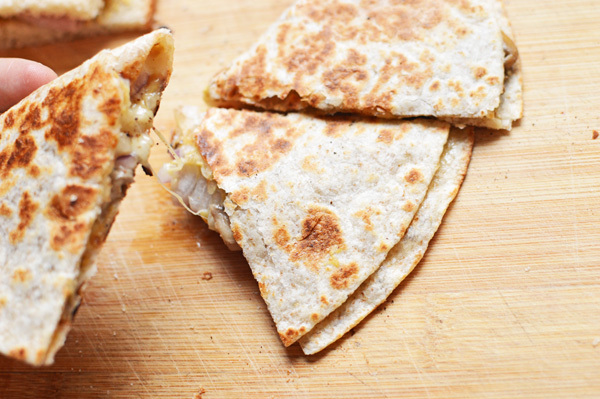 oooh this melting hot cheese. 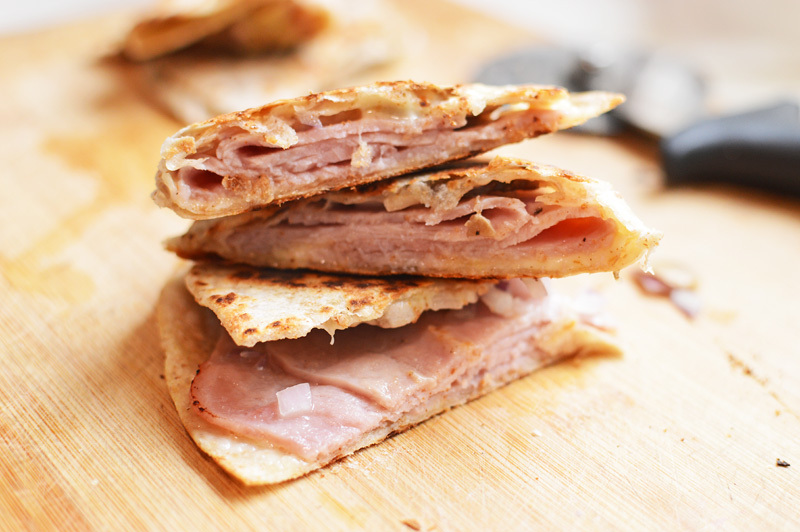 This is sandwich heaven right here. this cheese!! can you see all the melting richness? these are so unbelievably gorgeous. It’s the breakfast to end all breakfasts. 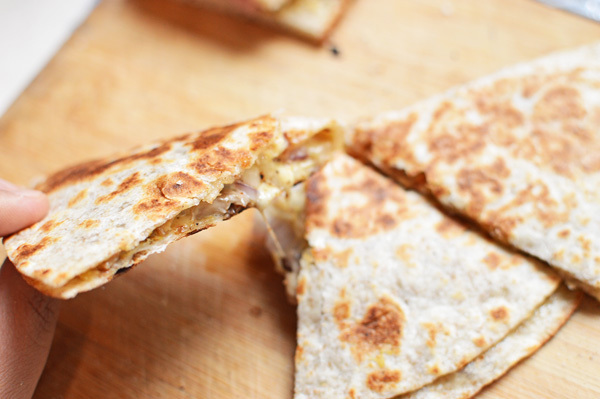 The quesadillas of oomph!! This took me about 10 minutes to make. Couched with a flask of hot tea, this breakfast made in moments was also one of the most satisfying ever. 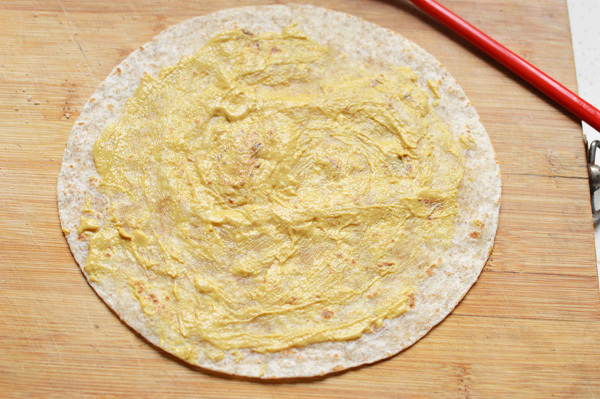 How to: Lay out the tortilla and spread some mustard. 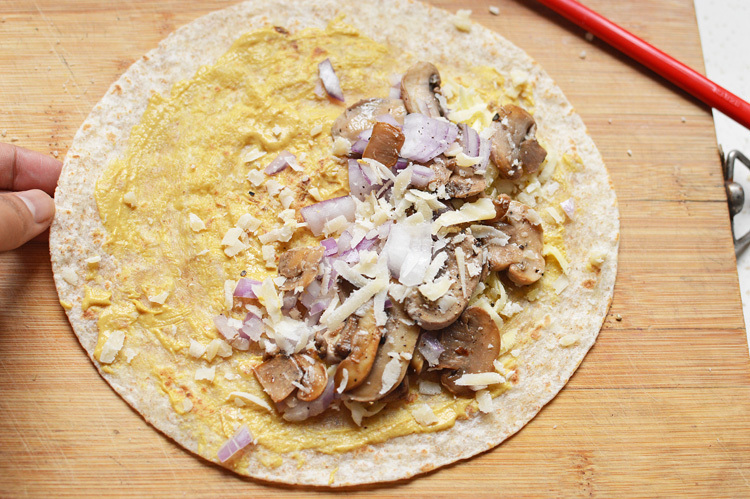 On one side layer the cheese, the vegetables, sprinkle some pepper and add some more cheese. 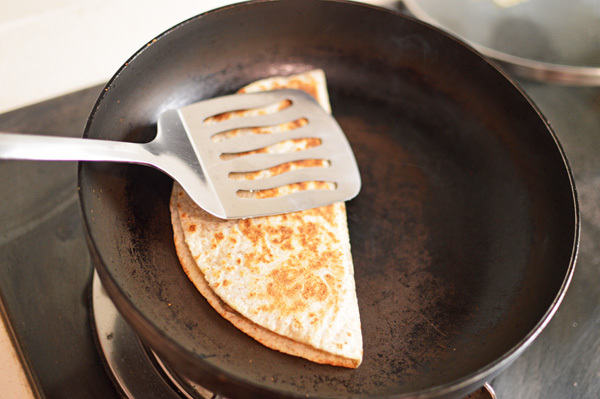 Fold to form half moon and transfer on a hot pan to brown and melt the cheese. Cut into 3 wedges and serve. 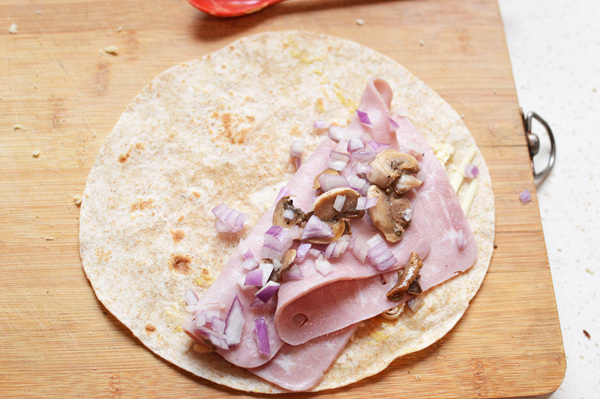 Repeat the same steps and add ham either cut into thinner strips or just as whole slices. 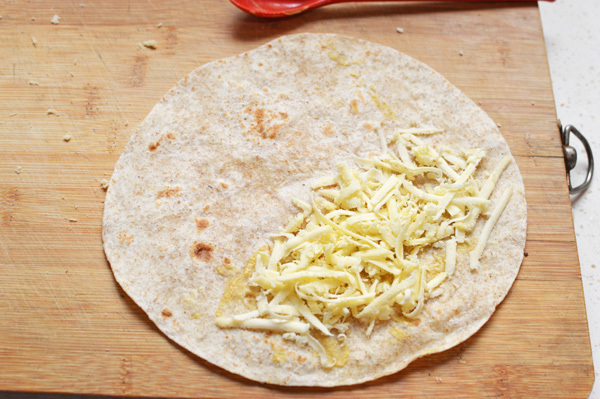 If you wish you can add the remaining vegetables and transfer on a hot pan to let cheese melt and tortillas brown and crisp. 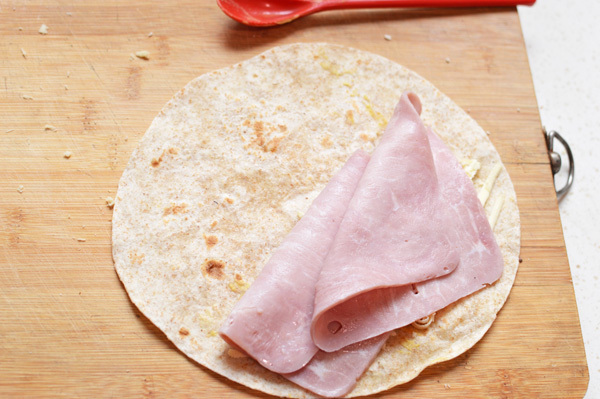 This is just an interesting idea to prepare a feast like breakfast without any effort. Of course by all means, eat it any time of the day and it’d still taste as delicious.